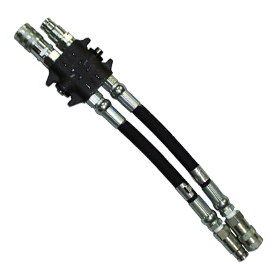 The Tool Exchange Valve is intended to function as a momentary on/off valve that, when plumbed between a tool and the end hose, will allow the end user to change tools without having to turn off the hydraulic circuit. In the “On” position, hydraulic flow will flow through the valve to the tool, allowing the tool to operate normally. In the“Off” position, hydraulic flow will be blocked at the valve, allowing the tool to be disconnected and an alternate tool to be attached. Shifting the valve back to the “On” position will resume hydraulic flow to the alternate tool.